Messager, André. 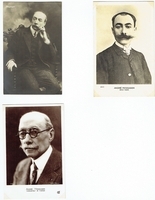 2 unsigned sepia photo postcards 3.5x5.5 - 1 (343) A.N-Paris, 1 Edition Moos-Karlsruhe. 1 sepia photocard / 1 sepia photocard Collection Félix Potin 1.75x3. Home > Previous Auctions > Ephemera Test > Messager, André. 2 unsigned sepia photo postcards 3.5x5.5 - 1 (343) A.N-Paris, 1 Edition Moos-Karlsruhe. 1 sepia photocard / 1 sepia photocard Collection Félix Potin 1.75x3. E00840. Messager, André. 2 unsigned sepia photo postcards 3.5x5.5 - 1 (343) A.N-Paris, 1 Edition Moos-Karlsruhe. 1 sepia photocard / 1 sepia photocard Collection Félix Potin 1.75x3.